Karl and Izzy are leaving the hospital, arm in arm. Karl says that Izzy must be really hungry, but she says she's ok for now. Izzy thanks Karl for staying with her all night, but he says that he just couldn't leave her. Karl then goes on to say again about Izzy being hungry "You must be starving" he says, "I could eat a horse' says Izzy jokingly. They are then stood at the top of the stairs of a the hospital car park. At the top, Izzy turns around to Karl and says her ring is at the bottom of the lake. As she is speaking to him, she see's Darcy instead of Karl. Darcy is saying "I know the baby is not Karls". Izzy goes an awful shade of grey, and falls backwards down the stairs. Karl looks on, until his eyes are just fixed at her, lying unconscious at the bottom of the concrete stairs. Moments later, Izzy is being wheeled into surgery in the hospital, leaving Karl waiting for answers. Sky and Lana are chatting about their magazine drawings. Lana then goes on to say that Jen is coming to take over her shift at 10.30, so maybe we could do something then. Sky asks her if she wants to finish their movie looking very excited. Both girls go off on a random cartoon laughing high. The laughter stops when Boyd walks in, and totally blanks Sky. Lana tells her to go and talk to him, but Sky doesn't seem too sure. Max is cleaning the tables, ready for opening. Lyn nervously walks in and says Hi. Max replies in a jokey way "Isn't it a bit early to be drinking Lyn? ", she puts on a nervous laugh. She then asks if he's heard anything from Steph up in Bendigo. Max replies with very short answers, but sarcastic ones at that. "Steph says it's lovely up in Bendigo, and she and Joe are having a ball." Lyn doesn't look impressed, nor does Max when she keeps asking him about Steph's feelings over the break-up. He says that he doesn't want to get involved, leaving Lyn looking upset. Sky goes up to Boyd and offers him some chocolate cake. He declines and doesn't speak. They begin to talk about Travis, Boyd doesn't look too enthusiastic talking to Sky, and she senses that. Sky then goes on to say that she did really want to call him, but just didn't know what to say. Lana walks over and offers then a drink for their walk that they are about to go on, to sort their problems out. Boyd and Sky laugh. Boyd and Sky are sat in a car kissing. They can't keep their hands off eachother, as they have missed eachother for so long. They start to talk about how they should sort things out. "I was worried about you" says Sky, "Hey, I had it sorted" said Boyd. They look so comfortable with eachother. They begin to kiss again. The camera then zooms out, to Lana stood watching them at the end of the road, looking jealous and upset. Lib, Susan and Ben are walking along the corridor, going to get as coffee, as they are too early for Ben's needles. Susan spots Karl sat on the bench in tears. She asks him what up, but he can hardly get a word out. "She fallen....she fallen down some stairs...she's in surgery now". Libby and Susan looked shocked. 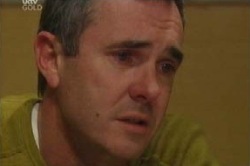 Susan tries to comfort Karl, until the doctor comes out and asks him to go into the room with Izzy. He leaves Libby and Susan behind looking shell shocked. Boyd and Sky come to ask Lana and her friend if they want to see a movie. Boyd says "Come on it will be fun, Gay/Straight double dating, it will be fun". Lana doesn't look too enthusiastic, but agrees. They go and sit down, to talk about which movies are worth seeing at the moment. Izzy is lying in the bed, with Karl sat by her side. She begins to come round, but is still very confused. She starts to ask what happened and how her baby girl is. "What am I doing in here?" "Don't get excited, you have a very bad concussion" Karl says. "What happened to my baby?" she says. Izzy lets out a scream of terror. Karl sits by her side, holding her and crying. Out in the corridor, Libby and Susan both look up as they hear the screams from the room. They can work out that all is not well with the baby. Susan looks sympathetic. Summer is saying how cool it is having the fridge in the hall. Max quickly reminds her that it is going straight back into the kitchen when it's finished. They go and sit down in the lounge and begin to laugh. The phone goes and Max answers it. It's Karl, telling him about whats happened, he just looks shocked. Max runs into the room, where Karl and Izzy are sat in silence. Izzy looks on in a complete daze. "Thanks for coming so quicky" says Karl. Max kisses Izzy on the cheek, and says he will go and check on Summer, as she didn't take it too well. In the corridor, Susan is sat comforting Summer. Max returns and says that I think it;s best they go, as it;s not very appropraite them being here now. Susan looks stunned, but Libby says they are here for dad. He asks them why they were here in the first place, but Libby proves that it was for Bens jabs. Max says he still thinks it's best they go. Susan gets Libby and takes her away. Max looks heartbroken. The gang have just come back from the movies, with Boyd telling Lana that he knew she would enjoy the film. Lana says she did and that she was actually quite suprised. Boyd and Sky, after a few drinks and snacks, decide to leave. When they have left, Lana tells her friend of her feelings towards Sky. She tells Lana that it is too messy and complicated, and that she will get hurt. Susan, Lyn and Libby are all sat chatting about what heppened to Izzy. Lyn says that it must be the worst thing to ever have happen to you, all the Ladies agree. Lyn then says they should leave it a few days, and maybe send some flowers in for her. Susan says that Max made it pretty clear our sympathy would not be wanted at all, and that it would be very hypocritical for all us to act like we care now, just because this has happened. Libby then says that it still doesn't cancel out the fact that she broke up her family. The ladies sit and think, until Lyn says "It's a chance to bury the hatchet". Boyd and Sky have just returned home. They are chatting about the fun day they had together and how normal it felt. Boyd's phone bgins to ring, and they jokingly say that it's Max telling Boyd to wash the car or something. He listens to the message. It's of Max telling Boyd whats happened to Izzy. They both looked upset. Sky is ripping out her picture that she did of Izzy and while ago. '26 going on 36'. Libby knocks and asks if she can have a word. Sky invites her in. Libby says that Sky's recent picture isn't up to her usual standard, and wants to know what up. She is a bit short with Libby, so Libby asks her if everythings ok. She then starts to say "I've been getting these weird feelings for Lana, which I can't work out. I'm just really confused". Lana is chatting to her friend about the movie and what she could see. Her friend says when Boyd put his arm aroud Sky, she thought she was going to punch him. Lana tells her to keep her voice down, and that she wasn't like that at all. Her warns her that she will get hurt. Try and find someone who is going to love her the way she deserves to be loved. Libby is chatting to Sky about her feelings towards Lana. Libby tells her that it's only natural to want to try different things, but not to jump the gun too quickly. She also that that Lana's sexuality may be making her read too much into things, instead of just enjoying their friendship and what they have. Sky looks thoughtful, but still says she doesn't know what the feelings she is having means. Max and Summer are sat in the corridor, when Boyd comes running in. He asks if he can see her, but Max says it's not a good time, he can later. They all just sit and wait. In the room, Karl is sat chatting to Izzy, but she isn't saying anthing, Until he mentions the brain scan. "I meant our little girl" Says a teary Izzy. "I want to see her" she cries. "She was beautiful" whispers Karl. "Oh Izzy....." They both cry and hug. "I love you Izzy, and we will get through this."